Panic! 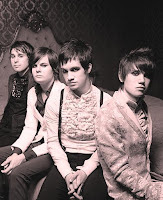 At the Disco band of United States; in July 2009 the guitarist-lyricist Ryan Ross and bassist Jon Walker left the group, now with two members... the album "A Fever You Can not Sweat Out" is But It's Better If You Do song strong, intense, melodic with great sound and voice.... Indie. Panic! At the Disco banda de Estados Unidos; en Julio de 2009 se separaron el guitarrista-letrista Ryan Ross y el bajista Jon Walker a pesar de lo cual el grupo continúa, ahora con dos miembros... de su disco "A Fever You Can't Sweat Out" es But It's Better If You Do canción contundente, intensa, melódica con pausas acertadas y gran voz.... Indie.